Having addressed the most probable strawmen that might be raised by Obama’s defenders, it’s time to face the extremely ugly facts of the Bergdahl situation. Obama now had three more impeachable offences to his 302 impeachable offenses to date. The first impeachable offense is that Obama broke the law requiring 30 days notification to Congress. 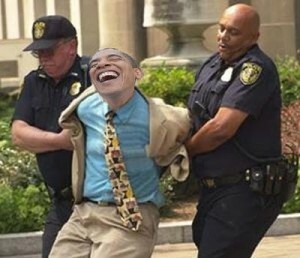 Even though Obama flouts laws with impunity, it still does not make it OK when he does it again and again and again. It’s the law. If the law doesn’t apply to the chief law enforcement officer in the nation, why should it apply to anyone else? Either we have the Rule of Law, or we do not – and it very much appears that we do not, and will not as long as Obama remains President. The second impeachable offense is that Obama didn’t trade for a POW – he traded five individuals who are classified as some of the most dangerous individual security threats to the United States – for a person who is at best a deserter, and at worst an outright traitor. Today’s news that there is a classified file on Bergdahl that contains information indicating he was voluntarily assisting the Taliban against US military forces, which would be as black-and-white of a case of treason as there is. If Bergdahl is the second coming of John Walker Lindh, Obama has some ‘splainin to do. Those following the story are aware that Bergdahl’s father has made a number of statements that are nothing more than English translations of classic radical Islamic jihadism, as well as indications that Obama personally both understood and approved of those statements. The third impeachable offense is the most minor, but it is impeachable nevertheless. Obama has completely misrepresented the situation to the American people and attempted to deceive us – a high misdemeanor for an individual in a unique position of public trust. Nixon wasn’t impeached over a “third-rate burglary”, he was impeached for lying to the nation. Be well aware that these are simply additional impeachable pebbles on the mountain of Constitutional offenses and mundane crimes committed by this administration. Even for Obama, however, three impeachable offenses in a single act is quite an accomplishment. Posted in Tyranny and tagged Crime, Impeachment, Obama, White House. Thank you very much for adding to the Impeachable List against Obama.The list is growing each day unabated, yet no one in Congress or the Senate is lifting a finger to stop him.